One of the issues we deal with here when planning to garden and landscape is the lack of good, nutrient rich soil. The Yucatan peninsula is an enormous limestone shelf with little or no soil cover at all in many areas. "Black dirt" can be purchased and delivered to your home or gardening project but even that is sadly lacking in essential nutrients and microorganisms to properly support plant growth. As we have been in rentals for the past seven years, making a major commitment to a garden has not been a priority. Now that the plans for our house in the jungle are being finalized and the date approaches for us to break ground, my interest in landscape design and garden planning has been piqued. Although our lot is located in the jungle with a fair amount of humus from centuries of falling leaves and other organic debris, we will still need to supplement the soil if we want to grow fruit trees and vegetables and maintain the lush green (completely inappropriate for the region) lawn my adorable husband is hoping for. As we will be situated directly above a delicate system of cenotes, we are not planning to introduce any chemicals or synthetic fertilizers in our efforts and will rely completely on biodynamic gardening methods and composting to create and maintain quality soil.The lot we are building on is pretty big so once we are out there we will be able to claim a corner for a traditional compost pile to convert grass clippings, leaves and such but in the meantime, I was looking for a more contained composting method. 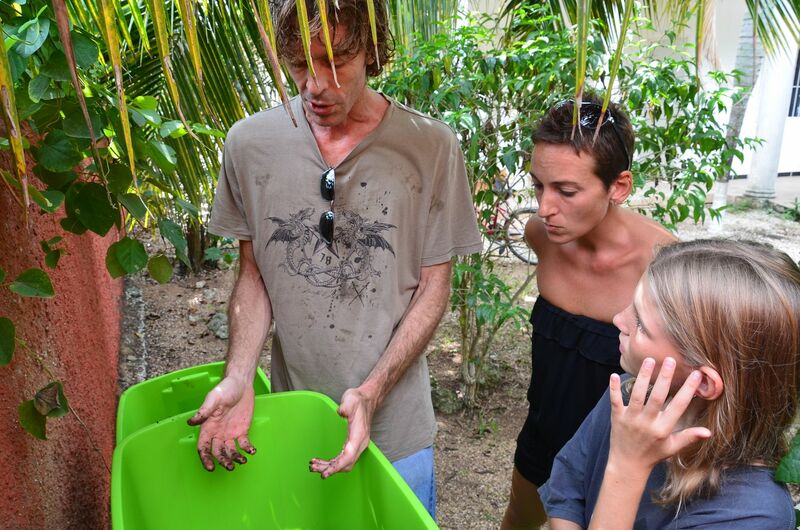 In June, I attended a vermiculture workshop being held in Puerto Morelos lead by Gerardo Villaneuva and found just the system I was looking for. Vermiculture is the cultivation of worms and the process of using them in the creation of vermicompost. 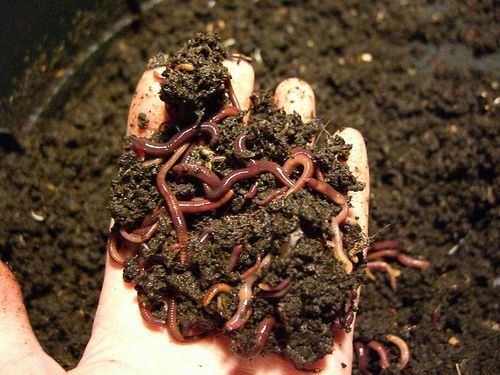 You contribute organic matter in to feed the worms and out comes "castings" or vermicompost, the world's best fertilizer, clean and easy to use. Worms ingest many kinds of organic waste, pass it through their bodies, converting it into humus rich vermicompost. 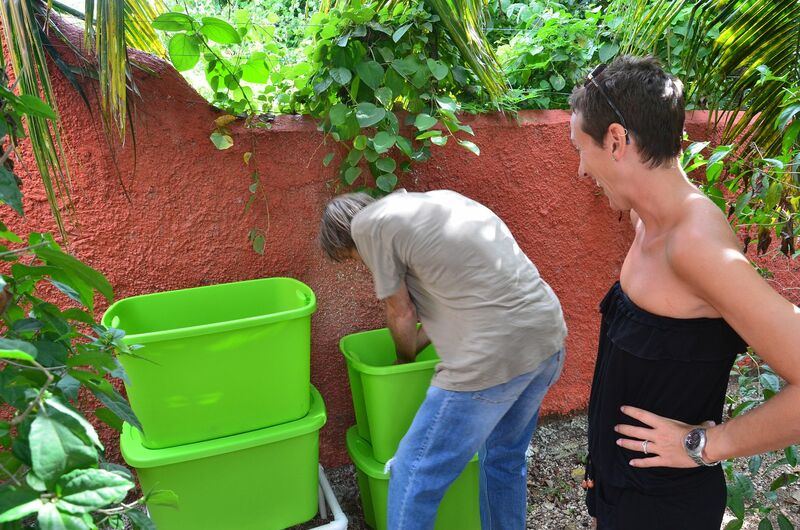 The vermiculture system designed by Gerardo is a great alternative for those who may not have enough outdoor space for a traditional composting bin or pile. 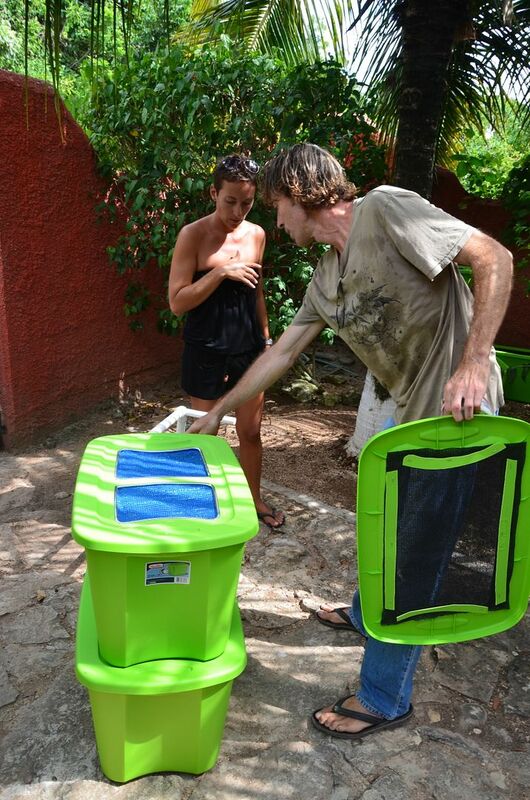 We purchased a system designed to process the amount of waste our four-person family would likely generate but he has smaller systems for singles and couples that could even be placed on an apartment balcony or small patio. Using this system, much of our household garbage will be converted into vermicompost, making good use of our household waste. My pal and soon-to-be-neighbor Mitch and I both ordered one of these systems but because I knew I would be traveling throughout the summer, I delayed delivery until today! This morning, Gerardo came to show us how and where to set up the system, gave us the basic feeding and harvesting schedule and gave us some ideas about how to best make use of these industrious worms and the garden fertilizer they create. He taught us to feed the worms a combination of "greens" including all fruits and vegetables, vegetable and fruit peels and ends and grass clippings and "browns" which can include coffee grounds and filters, tea bags, grains such as bread, crackers and cereals, eggshells (rinsed and crushed), cardboard, paper and dead dry leaves. No to be introduced to the system: meat, dairy, fats or oils, manure or feces and onions and, of course, no plastics, metals or glass. He also recommended we limit the amount of citrus fruits and peals to maintain a proper PH in the compost. One of things that particularly attracted me to this compost method was that is was clean and did not require too much of my attention. I'm running 24/7 and I didn't want to get into something that I could not easily maintain. I think this system is going to fit the bill perfectly. 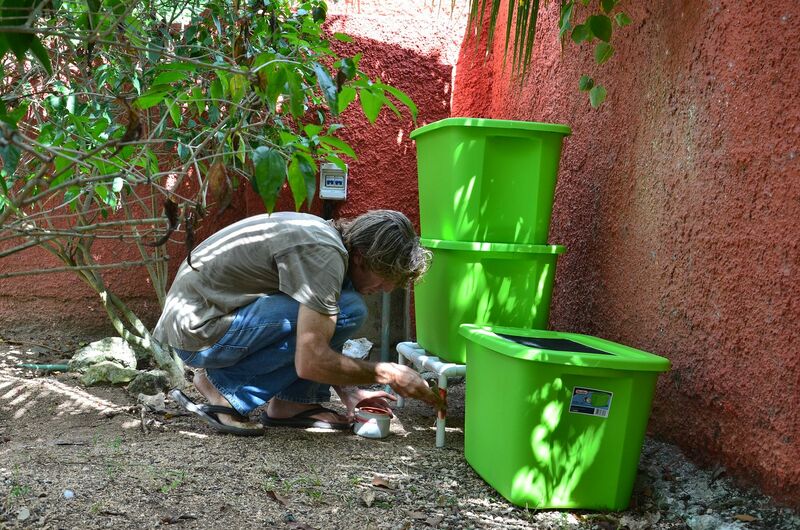 If you are interested in installing one of Gerardo's home vermicomposting kits he can easily create one for you to meet your needs. The set-up that we purchased cost 1500 pesos and included the worms and one-on-one instruction to make sure that we were comfortable with the process. You can reach him via email at imixlombricultura[at]gmail.com. Be sure to give him plenty of lead time as he has lots of projects already in the works. Between our two busy schedules it took us several weeks to find a time that worked for us both. 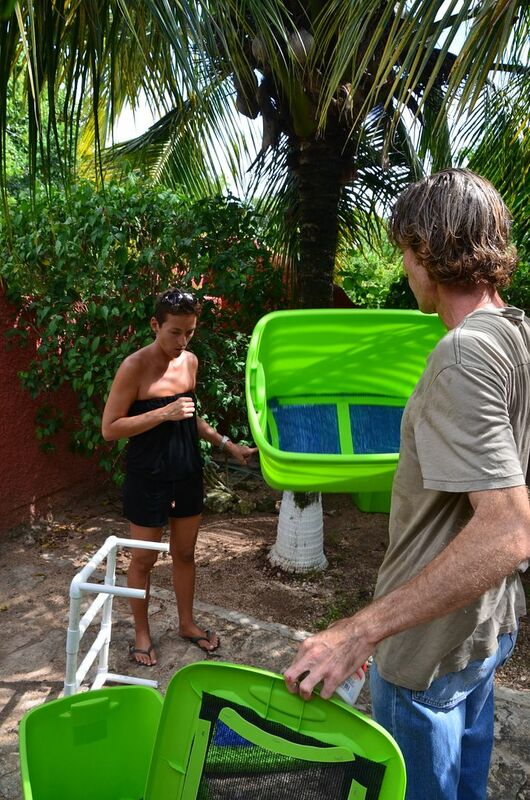 He is installing worm systems for Xcaret, the Waldorf school in Puerto Morelos, a boutique hotel in Tulum and various large resorts up and down the Riviera Maya. As the idea of sustainable living is really starting to take off here and more people are looking for ways to live in a way that protects our environment, it is not surprising that he is so busy! Vermicompost is an eco-friendly fertilizer created from biodegradable organic waste products and is naturally chemical free! Vermicompost does not have any adverse effect on soil, plants or the environment. Vermicompost improves soil aeration and texture thereby reducing soil compaction and promoting better root growth and nutrient absorption. 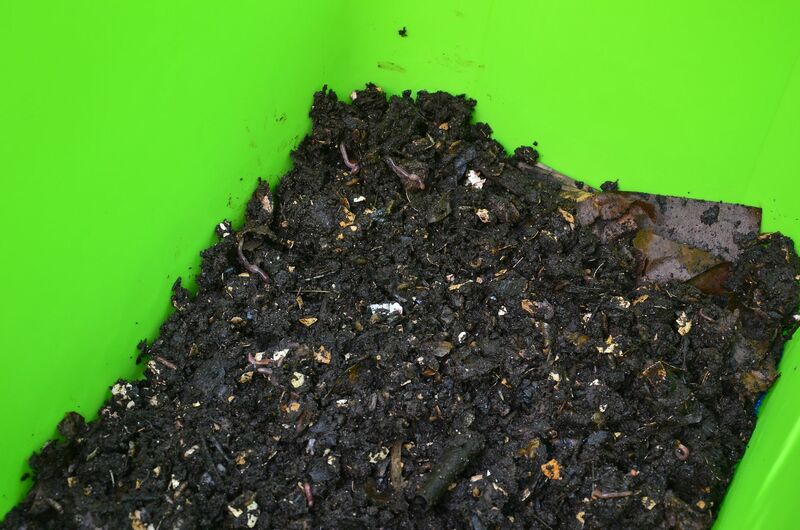 Vermicompost increases the water retention capacity of soil due to its high content of organic matter. 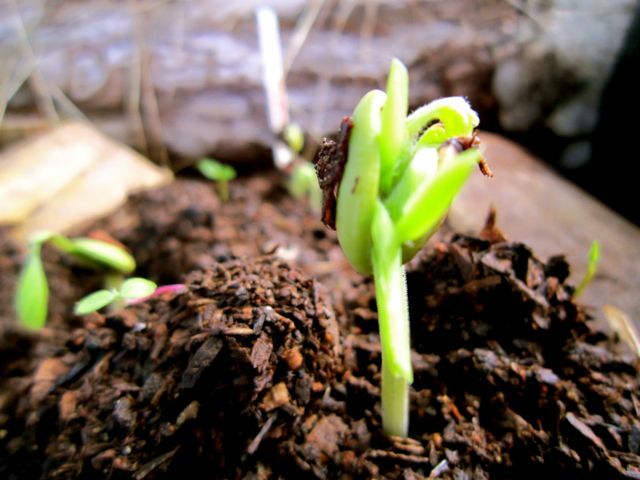 Vermicompost improves status of macro-nutrients and micro-nutrients in the soil.